Rosehaven Cottage: I got my very own "wild turkey surprise"
Does anyone else remember the old Bugs Bunny and Tasmanian Devil cartoon "Bedeviled Rabbit"? Bugs serves Taz a special "treat" called "wild turkey surprise". 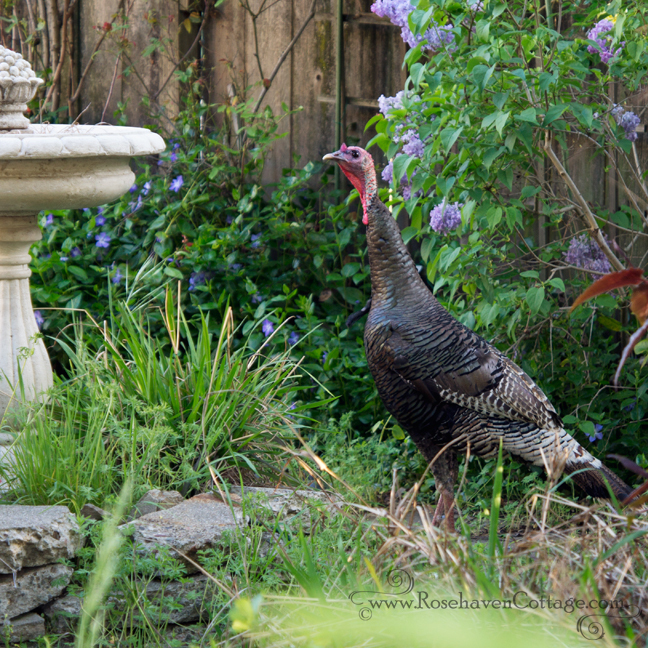 Well, I got my very own "wild turkey surprise" when I went out to stroll around the garden just before sunset on Tuesday. I walked down the deck stairs and headed to the bird fountain to top it off with water from the garden hose. I heard a funny "cluck cluck" sound coming from the vicinity of the mandarin tree just past the lemon tree. I'm used to just about every sound that happens in my garden so when I hear something new, it's obvious. I peered in the direction of the sound through the branches as I walked. Imagine my surprise when I saw a giant wild turkey meandering across the flagstones not far from me! Taller than a goose with the top of it's head about 4 feet tall, this thing was quite striking considering that most of the wild birds I see in my garden are far smaller. I immediately walked backwards as stealthily as possible toward the house so I could dash in to get my camera--hoping the whole time that it wouldn't leave until I got back out. 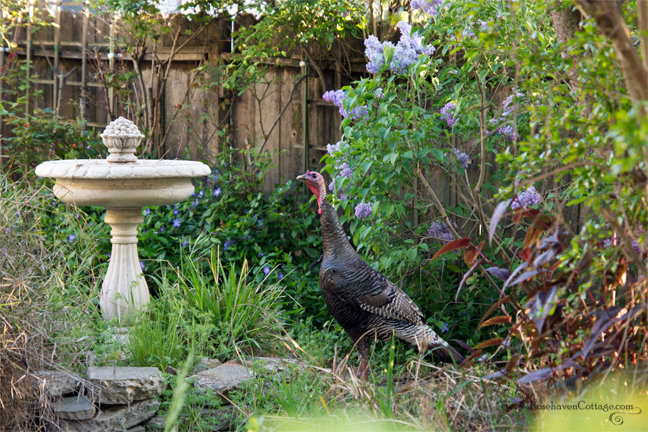 On my way in the back door I yelled to Hubby, "There's a wild turkey in the back garden!" and dashed into my studio to get my camera out of the camera bag. I was fortunate that it hadn't left when I got back out. The turkey was moving slowly through the garden mostly because it had a severe limp. I noticed a large patch of feathers on it's front that were out of place and sticking out at a right angle from its body. It looked like it had been in a recent scuffle. From what I could tell it was a male (possibly a juvenile called a "jake" but I'm not sure as I'm not well versed in wild turkeys). The turkey made an entire circuit around the garden following the path that goes around the pond. I kept my distance allowing the pond to be a buffer between it and I. I let my zoom lens bridge the gap between us. I didn't want to scare it or cause it to become agressive (turkeys can be dangerous if provoked). After getting a few shots, I put my camera down for a time while I filled up the bird fountain using the garden hose. It kept an eye on me from behind a palm tree. When I had my back turned, I suddenly heard a great commotion. I turned to see that it had taken flight and was sitting on the roof of the neighbor's garage that is right on the property line between our garden and theirs. I went back inside to tell Hubby it was still there if he wanted to come see it. He did and we watched it from the safety of our deck chairs until it took flight again and flew to roost in the great stand of eucalyptus trees that grow just over our back fence on open land belonging to the nearby oil refinery. The rest of the evening we could hear the turkey's gobbling vibrato in the distance as the sun set just past the eucalyptus it had chosen to roost in for the night. I can now add this exciting experience to my list of wildlife encounters in my little semi-rural backyard wildlife habitat. Oh totally cool...I had no idea that they lived where you live. They are pretty wild around here, we don't see too many of them. Somehow the sentence that contained the words 'turkey' and 'palm tree' struck me as odd. I guess it's weird to me that anyone can have palm trees in their yard, now that I think of it.